Lifelong tinkerer and gadget enthusiast Mark Geddes was so frustrated with the lack of practical, visual Arduino guides for teaching his ten-year-old that he wrote his own book on the topic. 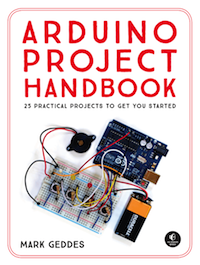 Titled Arduino Project Handbook: 25 Practical Projects to Get You Started, Geddes' book is a beginner-friendly collection of 25 fun and interactive projects to build with the low-cost Arduino microcontroller. Projects range from disco strobe lights and joystick lasers to rocket launchers and laser tripwires. This is a step-by-step project book, suitable for total beginners just starting out as well as for more experienced makers looking for inspiration. Readers will get set up with introductions on the hardware and software along with advice on tools, components and workspaces. Then it's time to choose a project to build from scratch, using straight-forward instructions, color illustrations, simple circuit diagrams and the complete code to program the build. The Arduino Project Handbook is a fast and fun way to get started. The Arduino Project Handbook is published by No Starch Press.